Earlier this month, we have reported that Samsung initially made a prototype of its Galaxy S8+ with a dual rear camera on board. Later on, the South Korean giant decided not to go with the dual cameras and included an unchanged single camera from the Galaxy S7. This raised several eyebrows as the difference between the Galaxy S8, and S8+ is just the display size and battery capacity, and many hated it as well. 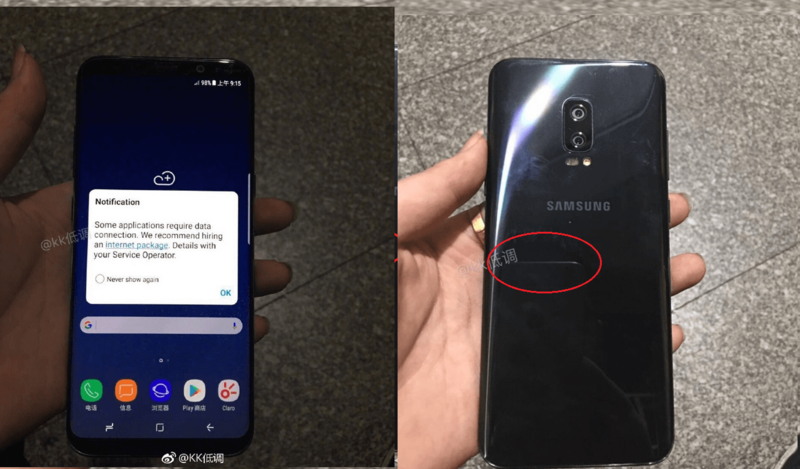 Weibo has leaked two photos of the prototype unit of the Galaxy S8+. The frontal of the phone is similar to the S8+ design, but the rear side of the phone has two cameras vertically followed by a LED flashlight. The interesting part here is the absence of fingerprint sensor. Earlier speculations suggested that Samsung is looking to integrate fingerprint sensor into the display of the phone. Going by this image, the rumour seems to be true. Some speculations before the launch of Galaxy S8+ claimed that Samsung has gone with the rear faced fingerprint sensor due to the lack of time, and that seems to be true as well now. We’re bringing all of them to your notice because Samsung might integrate all these missed out features in their next upcoming flagship phone, which is the Galaxy Note 8 pegged to release some time in August this year. A recently leaked image of the Galaxy Note 8 revealed that the phone’s design would be identical to the Galaxy S8 series, plus the trademark S Pen. Another report cited that the Samsung’s Exynos 9 series will support the dual rear camera, which is another slight hope that Samsung will embed dual camera on the Galaxy Note 8. Samsung is the only major brand which did not employ dual camera technology in its smartphones, which is underwhelming by the company’ standards. Moreover, Samsung might integrate the fingerprint scanner into the display of the phone, but these are just our speculations and nothing is confirmed for now. Would you like to see a Galaxy Note 8 with a dual rear camera and in-display fingerprint scanner? Let us know in the comments section below.